OK, so the Carrot Cake Oatmeal Cream Pies were pretty amazing, right? And perfect for bringing to a special occasion brunch. But we can't just go around eating cookie and frosting sandwiches every day! We can't. Trust me. I've tried. So, enter trusty Mama Pea's healthier version of carrot cake! A more healthful, with vegan options, cake, that is almost as delicious! I love that she has you steam and puree the carrots, instead of just grating. They seem to add more moisture, and you don't have any crunchy carrot bits in your cake! It really did seem to work! I like this alternative for three reasons. 1. Flax is a super health food, and if I can throw a little into my cake, then why not? 2. I rarely actually have eggs in my fridge, and when the mood strikes to bake a cake, and it does, it is nice to have an alternative. (Keep your nuts and flax seed in the fridge so they last longer). Now, I will say, this more healthful cake wasn't quite the same. And the almond and flax meal do give it a much heartier texture. But, it was NOT. BAD!! 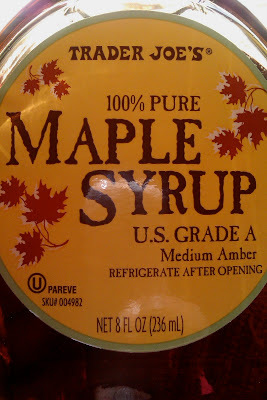 But, I did substitute 100% organic pure maple syrup for all the sugar, and you could go further by using coconut products instead of the dairy. Side note, have you guys tried 100% pure organic maple syrup? NOTHING like Aunt Jemima, let me tell ya. It has a much thinner consistency, and such a light, clean, pure taste. I loved trying it as a sugar replacement in this cake recipe. I am having fun experimenting with healthier baking options, like the almond flour, flax "egg", maple syrup, etc!